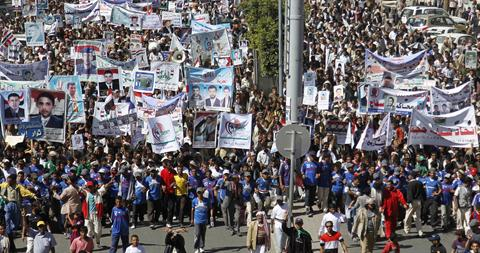 Thousands of Yemenis protested on Sunday against an immunity law protecting outgoing President Ali Abdullah Saleh from prosecution and demanded he be put on trial for offences they say he committed during his 33-year rule. More than 50 students from Tuscon High School walked out of class on Monday and marched toward Santa Rita Park in protest of the recent ban on Mexican American studies at TUSD schools. In Egypt, dozens of employees at the state-run Nile News TV Channel started an open-ended strike Sunday at the Maspero building, as they protested policies still in place since Mubarak’s rule. Malawi lawyers across the country Monday protested in their court regalia to pressure the governement to act on the ongoing judiciary strike. Truck drivers across Italy went on strike on Monday against increased fuel prices, while taxis also held a national protest over government reforms to increase competition, causing disruptions nationwide. Scores of protests were held across the country on Friday to protest the second anniversary of the Supreme Court’s Citizens United ruling, which ruled corporations have a right to spend unlimited amounts of money on political campaigns. A dozen demonstrators were arrested on the U.S. Supreme Court steps. In Lebanon, severe electricity cuts fueled several protests Friday as residents and lawmakers staged a sit-in in the mountain town of Aley and small groups of protesters blocked roads in the south of the country. Several women and children staged a sit-in outside the Karachi Press Club (KPC) on Friday to protest against the kidnapping of Baloch youths and the dumping of their bodies in different parts of the province. Protests in two West Bank universities have shut down classes in recent days, as students call for easing of tuition fees amid financial crisis in Palestine. Beginning last Tuesday, about 100,000 teachers from 24,000 non-government primary schools in Bangladesh held a three-day strike to demand that they be brought onto the government’s payroll.